Can you imagine what it would be like to live in a cave, surrounded by cold rock and the sound of bombs crashing just metres away from you? How would it feel to creep out after nightfall to farm and cook while your children studied in an underground school? 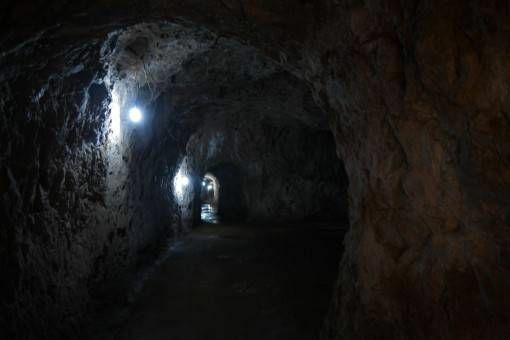 Well, that’s exactly how thousands of people lived during the American bombing campaign in Laos – Andrew and I took a trip to the historic caves in the north of the country to learn more. 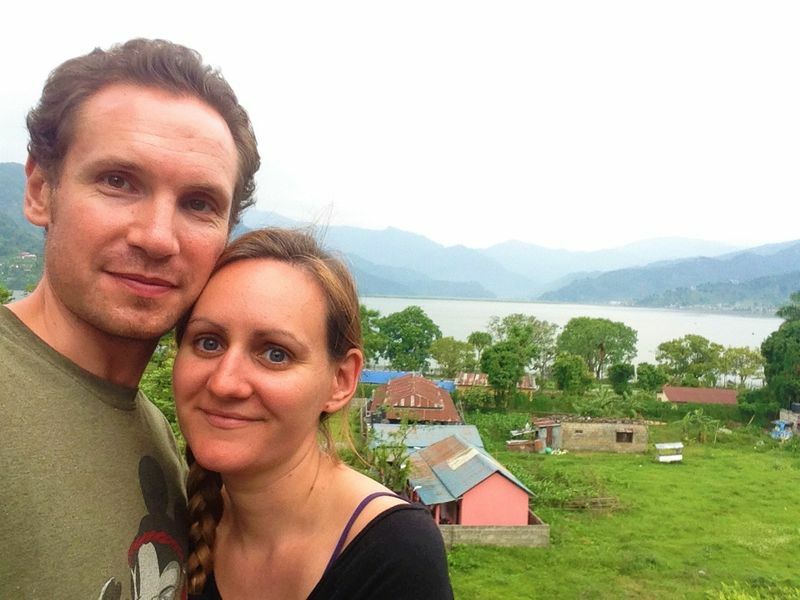 After discovering the mysterious Plain of Jars and learning about the Secret War in Laos during our stay in Phonsavan, we took a six-hour bus journey up to the mountain town of Sam Neua. 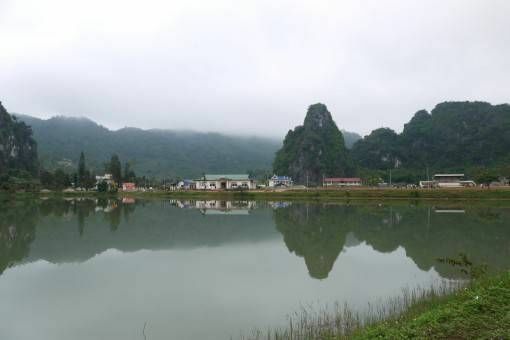 There’s not much going on in this tiny town, the main draw for tourists is the nearby Vieng Xai caves. 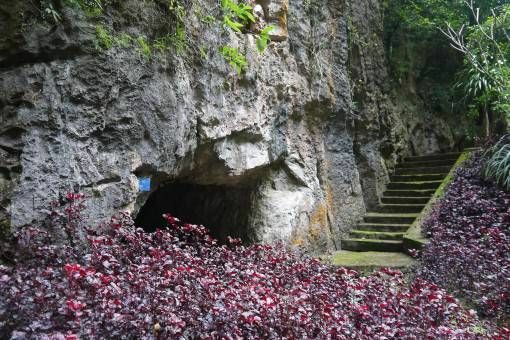 During 1964 and 1973, thousands of people belonging to a communist faction called the Pathet Laos hid in these caves to escape the American bombs. In fact, a whole world of bunkers, schools, hospitals and theatres existed within these huge limestone caves – much of which you can still see today. 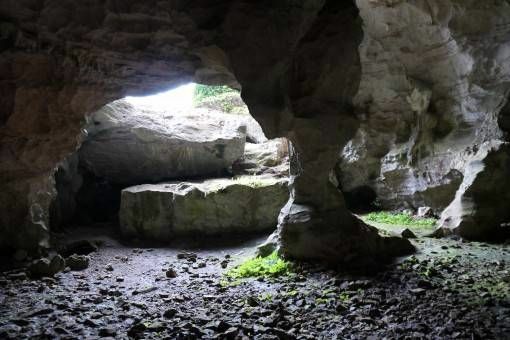 Although the caves are only an hour’s drive away from Sam Neua they’re frustratingly difficult to get to. We headed to the local bus station in hopes of catching a seven o’clock bus to get us there for the nine o’clock audio tour of the caves, only to discover that no such bus exists. In the end, we had little choice but to rent a taxi for the day, splitting the £20 cost with a German tourist called Vanessa. The journey itself was typical of Laos; we sped along windy, foggy roads, past tiny hamlets, people and animals; a man pulling a pig on a lead, women carrying babies or armloads of firewood and stray dogs curled up on the roadside. The caves are set apart from each other so you need to rent a bicycle from the visitor centre, where the audio tour begins. However, since we’d already paid a driver for the day we got lazily chauffeured around for the four-hour tour. As we toured the caves we enjoyed our excellent audio guides, which included interviews from people who had actually lived in the caves. We were amazed to see how sophisticated the set-up was; caves were split into living areas connected by tunnels to larger communal areas. 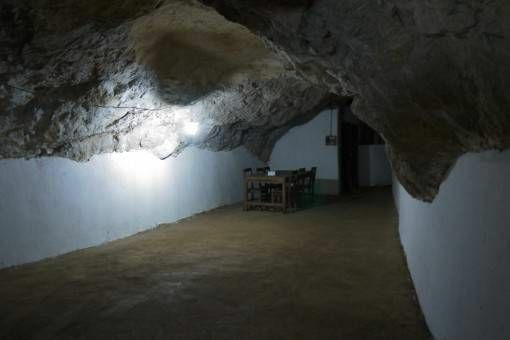 There were military barracks and government quarters; the Prince himself lived in the caves with his family and an army jeep still sits in the garage outside one of the caves. There’s no doubt that life underground must have been pretty bleak. Under the threat of being ‘Bombed back into the Stoneage’ by the American Air Force, people couldn’t go out during the daytime for fear of being spotted and targeted; smoke from cooking fires or colourful chickens could also give away their location. The Laos people were reduced to farming during the night and food was scarce since crops and livestock were often destroyed by the air raids. The caves themselves didn’t offer full safety, people lived in fear that bombs would be shot into the entrances, causing collapse, or that a chemical attack would be launched. 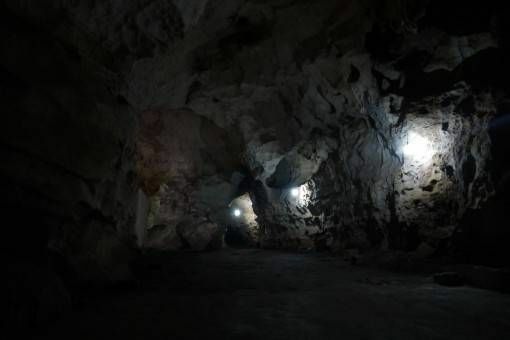 Inside most of the caves there were small bomb shelters with Russian-donated air pumps inside in case of such an attack. We ascended a steep flight of stairs to the mouth of a cave where we took in the surrounding views and learned how, from there, Laos soldiers would attempt to shoot down American planes, occasionally succeeding. Venturing onwards we saw the school and hospital caves, as well as a theatre used for weddings and film screenings. The landscape surrounding the caves was beautiful, a million shades of green dotted with colourful pin-pricks of flowers and fruit, in places the ground was still scarred by deep bomb craters – more evidence of the past war. At the end of the tour we drove past a lake, its surface a sheet of glass reflecting the hulking limestone mounds above. School children rode past us on bikes and waved, free to live above ground in the sunshine, a luxury they would have been denied had they been born half a century earlier. Our audio tour of the Vieng Xai caves cost £4.75 each (60,000 LAK). The earliest bus there from Sam Nuea leaves at around 8.30am, however there aren’t any guaranteed buses back from Vieng Xai so you may want to hire a taxi instead, ours cost £20 for the day. The caves of Vieng Xai are really fascinating. Never been there though. 60,000 LAK seems like a lot of money but when converted to pounds it seem reasonable. It was really very cheap actually, especially considering how great the audio guide is. The most expensive and awkward part of the day was definitely getting there and back, worth the effort though! I love these photos! I love caves and tend to seek them out where my partner and I are. 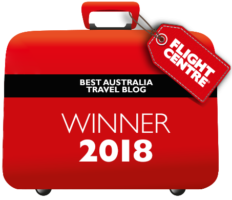 Currently in Cambodia and did not have any immediate plans to go to Laos, but I just may have to add it to our “to-go” list now! We love caves too Jenny; the Vieng Xai caves were the best we’ve seen so far on this trip, minus the glow worm caves in New Zealand which were incredible.